L 10 1/2″ (27 cm). Description: Sexes similar. 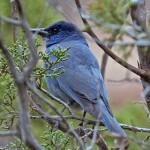 Gray-blue overall, darkest on the head; blue throat streaked with white; no crest; long, slender bill; and a short tail. Immatures are paler, and grayer overall. 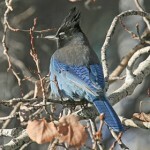 Behavior: Flight is direct, with rapid wingbeats. 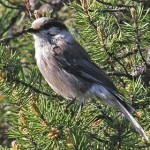 Habitat: Found in pine forests where the soil is fairly dry, and the trees are small and scattered. Where in Nebraska: Uncommon permanent resident of the Pine Ridge area. Vagrants seen in other parts of the state during the winter months. Field Notes: Usually seen in large flocks, often numbering in the hundreds. 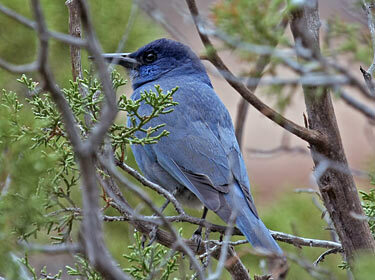 Fun Facts: Although omnivorous, the Pinyon Jay’s favorite food is pine seeds.